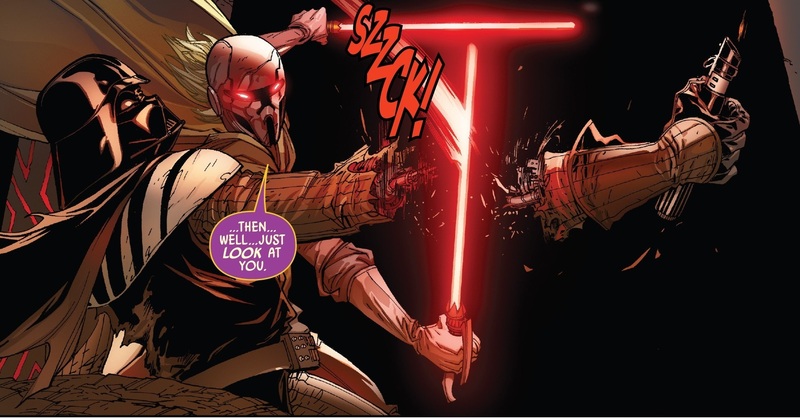 The recent Darth Vader Comics by Charles Soule introduced Star Wars Fans to two of the oldest named Sith Lords in Canon, Momin and Shaa. During his childhood, Momin could be (in some sense) considered an artist, a sick and twisted artist but a young boy who desired to create and elicit emotion from his audience. Unfortunately for young Momin, he revealed in making others feel disgusted, achieving this through the killing of small animals and using their lifeless bodies to create what he would call art. After unveiling his questionable art (heck even Thrawn would probably call Momin out on his tastes) the people of his world had him imprisoned. It wasn’t long until be was freed by a red lightsaber wielding woman called Shaa. She then taught Momin the ways of the Dark Side of the Force, taking him in as an Apprentice. Which at this point Momin was a young adult. Later Momin would then slay his Master in combat. Instead of taking on an a Apprentice of his own, Momin would continue to teach himself, he not consider himself a master and had no desire to teach others. Thus setting himself apart from other Sith. Momin would continue to create “art” with the intent of glorifying the Dark Side. Which eventually led the Sith Lord to create a weapon that was powerful enough to burn cities to ash, planning to freeze the destruction in time as an eternal shrine to the Dark Side and the planet he chose to create his masterpiece was none other than the planet Mustafar. The ritual was soon interrupted by the Jedi, which resulted in Momin losing control of the force and apparently vaporising, leaving behind only his helmet. While the Jedi intervention stopped Momin’s super weapon from destroying Mustafar is was left forever changed. 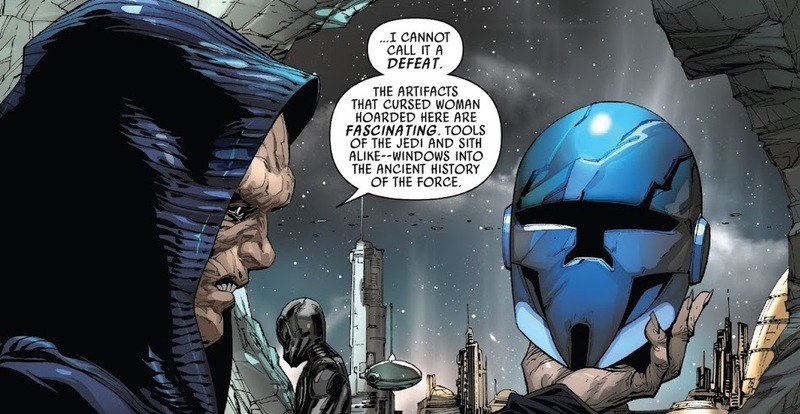 Momin’s helmet would be then taken to the Jedi Temple on Coruscant where it was locked away for at least a thousand years, possibly longer. Where it remained until the rise of the Empire. After Order 66 and Palpatine reorganised the Republic into the first Galactic Empire, former Jedi Liberian Jocasta Nu infiltrated the Jedi Archives to unlock the secret room to recover a list of Force Sensitive children, but was stopped by Darth Vader and the Grand Inquisitor. After Jocasta Nu’s death, Emperor Palpatine then took possession of the helmet and was even able to communicate with it either by using the force, or by wearing it. Later when Vader travelled to the planet Mustafar to construct his fortress, Palpatine gifted him the helmet of Lord Momin. Vader soon discovered the helmet had the ability to influence and possess people and so the two Sith Lords began cooperating to build a fortress that could tap into the powers of the Dark Side and pierce the veil between life and death, allowing Vader to see his wife Padme once more. 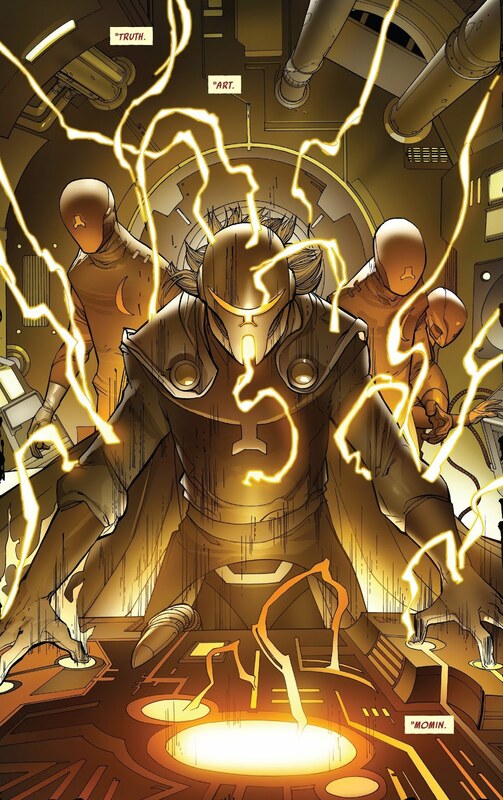 But Momin deceived Vader, creating multiple failed iterations of the fortress that disturbed the natural order of the planet, resulting in an all out attack from the Mustafarian natives when the fortress was complete. During the assault as Vader was dealing with the attackers, Momin pierced the veil himself, resurrecting his physical body to live once more. Expressing his disgust with the current state of the Sith as he battled with Darth Vader. 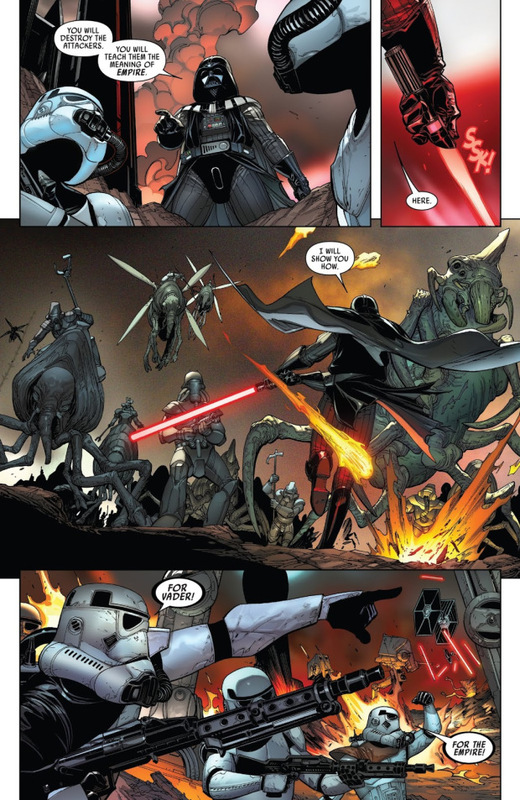 As the two Sith Lords dueled, Vader was dealt several devastating wounds. Reaching out with the Force, Vader single handedly rammed a massive stone slab into Momin. The stone crushed him against the wall permanently killing the physical embodiment of Momin. However the helmet survived. And it’s powers did not stay dormant. Years later Palpatine still had possession of the helmet. Which he kept with his collection of Sith artefacts. When Lando Calrissian and a team of unwitting criminals stole the collection, the helmet began to influence and possess them one by one. Forcing Lando to retreat and destroy Palpatine’s morbid museum. It is currently unknown if the helmet survived the explosion. The question is, will this be the last time we see or hear of Momin? Well Charles Soule, the writer behind the comic has stated he isn’t done with Star Wars yet. 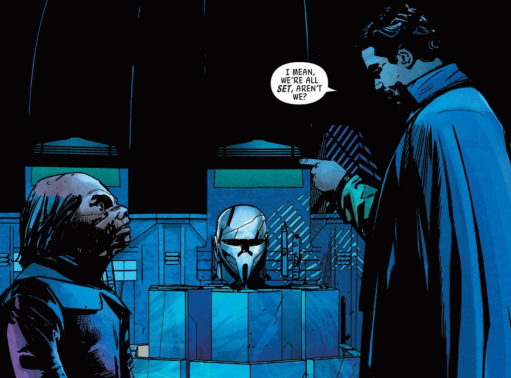 And could possibly write more content on the ancient Sith due to Momin’s appearances in both the Lando and Vader comics. Which in turn could start the jump into Old Republic content. An era of Star Wars fans have been wanting the new Canon to explore for sometime now.